The 458 Italia is Ferrari's two-seat, mid-rear engine exotic sport coupe, the result of an uncompromising design approach that integrates style and passion with cutting-edge, track-derived technology. It was designed for owners whose priority is on-road performance with occasional track day capability, but who still demand a car that is useable in day-to-day driving. 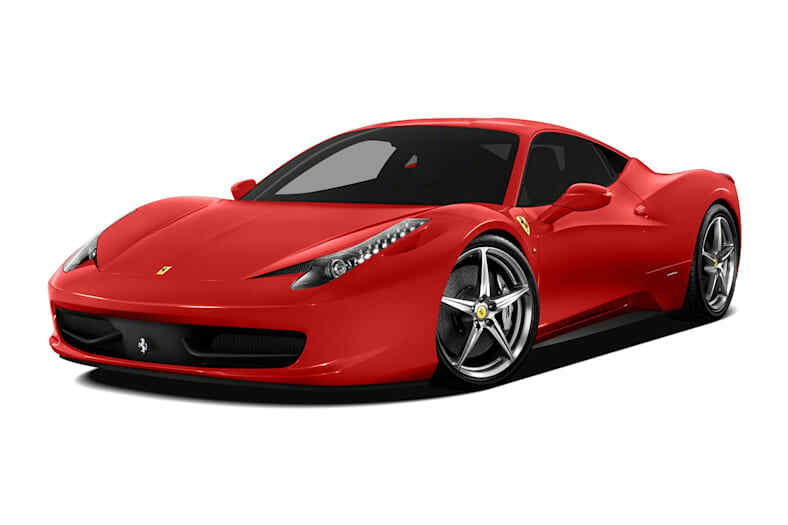 The 458 Italia's 570-horsepower direct-injected 4.5-liter V8 engine sends power through 7-speed dual clutch transmission with F1-style steering column-mounted shift paddles that allow for extremely quick gear changes. The standard E-Diff3 is an electronic limited-slip rear differential that varies the distribution of torque based on inputs such as steering angle and lateral acceleration. Brembo brakes featuring carbon-ceramic material discs as standard. Magnetic fluid-filled shock absorbers react instantly to road conditions and driver inputs. A switch on the steering wheel, called a manettino, integrates suspension, traction control, stability control and shifter systems and allows the driver to choose the optimum setting for current conditions. The standard 6-disc CD/MP3 stereo features a 30-gigabyte hard drive and Bluetooth wireless connectivity. Options include carbon fiber interior and exterior trim, adaptive headlights, navigation system, premium JBL 1000-watt audio system, reverse camera, and front and rear parking sensors. A wide range of interior and exterior colors are available. The Ferrari 458 Italia carries over for 2012. All 2012 Ferraris are covered by a new seven-year maintenance program.